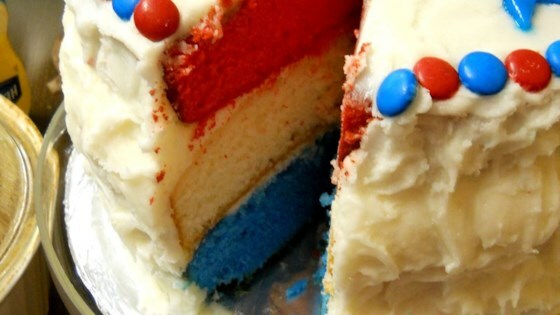 "This extra-moist cake with buttercream icing is sure to get firework-worthy oohs and aahs!" Preheat oven to 350 degrees F (175 degrees C). Spray 3 9-inch cake pans with cooking spray. In a large bowl, beat the cake mix, instant pudding mix, water, vegetable oil, and eggs together with an electric mixer to form a smooth batter. Divide the batter equally into 3 smaller bowls; tint one bowl to your desired shade of red, and one to your desired shade of blue. Pour each bowl into a prepared cake pan. Bake in the preheated oven until the cakes are set and a toothpick inserted in the center of the cake comes out clean, 10 to 15 minutes. The cakes will start to pull away from the sides of the pans when done. Remove the cakes, allow to cool for about 10 minutes in the pans, and then turn out onto 3 separate pieces of plastic wrap set onto a work surface to finish cooling. While the cakes are cooling, beat the butter-flavored shortening, butter, salt, and imitation vanilla extract in a large bowl with an electric mixer until creamy. Mix in 1 cup of confectioners' sugar at a time, beating in each cup well before adding the next. Mix in the cream, 1 or 2 tablespoons at a time, until the frosting is smooth and spreadable. To decorate, lift the red layer using the plastic wrap, and gently turn over and place onto a cake plate. Remove plastic wrap. Generously frost the top of the red cake, then place the blue cake on top. Frost the blue layer, then top with the white cake; use remaining frosting to frost the top and sides of the cake. If you add a few drops of white food coloring (Americolor brand) while mixing the cake, the batter will stay white instead of turning yellow from the pudding mix. I was very disappointed the layers were thin. The iceing to much like lard.Will not make again. Great idea for the holiday. I suggest using just egg whites, then the cake will stay white. Made this for the 4th. Every one went crazy for it. Shaped it like a fire work rocket with little cupcakes as sparks. Best dessert we ever made. THANX FOR THE RECIPE!